Health professionals are a trusted source of advice and are in an ideal position to deliver brief interventions for smoking cessation. It is important that health professionals ask all patients about smoking and know what they can do to help a person quit smoking. Brief interventions are effective. One in 33 conversations will result in a person successfully quitting. The start the conversation website has Dr Hayden McRobbie talking about delivering brief interventions and patients talking about their experience of receiving smoking cessation advice. Brief interventions can take as little as a few minutes and have life changing consequences. 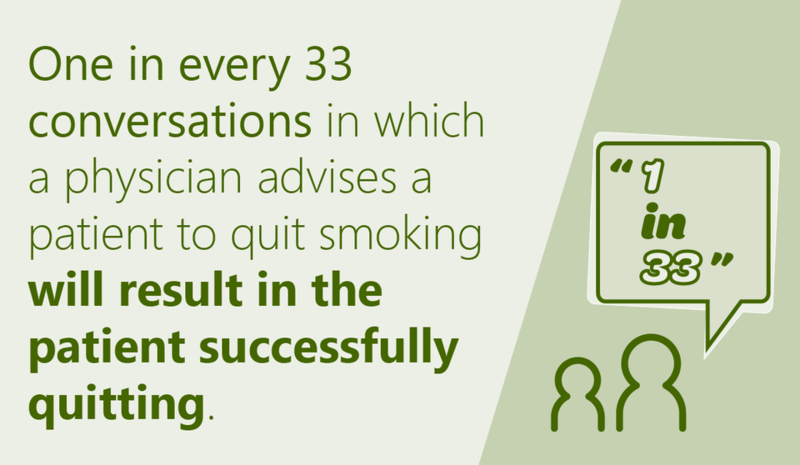 Brief interventions to help people stop smoking are made up of opportunistic advice, encouragement and referral to external support provided by health professionals. There are many ways to deliver brief interventions. Health professionals tell us that a lack of time often prevents the routine delivery of brief interventions. It is straightforward, practical and can take as little as 3 to 5 minutes. Research overseas shows that 3-step models are effective. Working with health professionals, we have applied this model in general practice, mental health, oral health and homeless services. Quit provides training in delivering brief interventions either online or in workshops. Everyone who works with patients or clients and wants to encourage people to be smoke free can do this training. All health professionals have a role – general practitioners, oral health practitioners, nurses and allied health professionals (including psychologists, social workers, occupational therapists, dietitians, and physiotherapists). Our free online training will equip you with the skills and strategies to deliver a brief intervention. Workshops give you the opportunity to practice delivering brief interventions using complex case examples and opportunity for self reflection and how to embed brief interventions into your practice. Registration opening soon – check back here for updates. Quit has been the principal agency for population-level tobacco control in Victoria for 30 years. We are funded primarily by VicHealth and the Department of Health and Human Services and, as a unit of Cancer Council Victoria, we also draw on Cancer Council resources and expertise. Quit works closely with the Heart Foundation (Victoria), plus other Cancer Councils, Heart Foundation divisions and tobacco control counterparts around Australia and internationally. We have trained over 2000 health professionals and community and social service workers and currently have over 500 active Quit Educators. We provide ongoing support to our Quit Educators via free resources and our free annual Quit Educator Inservice. This training has been refined from participant feedback and always incorporates the latest evidence and best practice.